Our greatest success story this past year concerns a woman named Lisa. Many of the guests we see at the shelter are struggling with substance and/or alcohol abuse, mental health issues, the loss of employment or the breakdown of a relationship. Every story is different, but each contains the same core of circumstances. Lisa was no different. We first encountered her as part of our PATH outreach approximately 4 years ago. At the time, we weren’t sure if she was homeless or if she had a place to stay. Each time we talked with her, we’d get a friendly, sunny smile and reassurance that she was fine. Over time her circumstance must have changed because it became apparent that she was in fact camping outside. Our PATH outreach case manager worked diligently to improve her situation. In November of 2015 we were able to convince her to come into the shelter. Lisa’s mental health was always a question; one that we had no ready answer for. Through the patient and persistent work of our Shelter Aides, we were able to piece together her story, although there are still quite a few blanks that we just don’t know. She has completed at least 2 years of college, was once married, and reportedly has a child or two as well as a few siblings. Through many months of persistent contact, our shelter aides and housing navigator were able to build trust with Lisa and gain enough details to be able to help her get her birth certificate, social security card and identification. Once Lisa had these documents, shelter staff began the process of helping her get disability income, health insurance and suitable housing. After 17 months, Lisa; our longest stayer, was housed. She comes by the shelter from time to time and our case manager still works with her. The change in her is amazing and she loves her new place. Some of our shelter staff donated a few household items to her, much like you would for a favorite relative. We housed over 100 people this past fiscal year, but Lisa was by far the most rewarding. Cheryl first came to Bangor Area Homeless Shelter in June of 2016. She had never stayed in a Shelter before. She was fleeing from roommates who had become increasingly abusive to her and her autistic son. Cheryl’s son was able to stay with her ex-husband while she was at the shelter. She would take the bus up to Old Town anytime her son had appointments for needed services, which at times meant getting up at 5:00 am to get there in time. Cheryl is a veteran and through her contact with Preble Street was referred to the shelter for assistance. I first came to the [Bangor Area Homeless] Shelter not knowing anything about being homeless. I have learned so much- not everyone wants this life of having no place to call home. I met other people who all have a different story. The Shelter has helped me find work and a place to call HOME! The Shelter helped me find the road back to life. There were things I thought I could not do and the Shelter helped me become stronger. I had my ups and downs but the one BIG lesson I learned was there are still good people out in the world that care. NEVER give up on people because there are good and caring people. Most of all, I want to say thank you to the staff for being there and listening and putting me back on the right road. 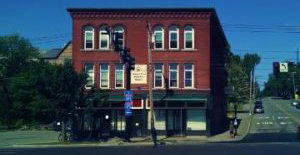 My name is Christopher and I stayed at the Bangor Area Homeless Shelter from mid June 2010 till October 2, 2010. While I stayed at the shelter they provided me with help to get a job, a safe place to sleep at night and 3 meals a day. The staff was awesome. They helped me get the medications I needed and the help I needed for my various problems. The staff is exceptional at the shelter. My case worker, Marla, is a person I owe a lot to for helping me get what I needed from my birth certificate to medications. She goes above and beyond what her job is and to her I owe a lot. The other staff, LJ, Holly, Rowena and Dennis all helped me to get out of the shelter. Dennis, the person who is in charge of the shelter, gave me tips on jobs he heard of as did all the staff. I made lunch there and helped out in the kitchen as needed. I am a chef and I love to cook. I did whatever staff asked me to do. I was thankful for a safe place to stay. Everyone at the shelter is a blessing, they helped when I needed it. I cannot say enough good things about the shelter. They help you get what you need to get you a place to live and get employment. I would like to say Thank You to all the staff and board members for the shelter and what they did for me and others. When I arrived at the Bangor Area Homeless Shelter, I thought life was over for me. With the help of the shelter, and the State of Maine, I found out how wrong I was—life had just begun. I am writing in support of the nomination of the Bangor Area Homeless Shelter as the Agency of Distinction for the 2008 Those Who Care Award. As a former client (guest) of the Bangor Area Homeless Shelter, I cannot stress the importance of the services this agency provides 24 hours a day, 7 days a week, 365 days a year. In September 2005 I stepped through the doors of the Bangor Area Homeless Shelter a nervous, defeated woman who was at the lowest point in my life with no options at all. Having a picture in my mind of what constitutes a “homeless shelter” and the stigma that is attached to someone who is “homeless” I was immediately impressed with how caring the staff was. And as the days followed, my confidence slowly begin to return and I know it was due, in part, to the caring, advice, respect, and at times, tough love that I received while a guest of the Bangor Area Homeless Shelter. February 2006 I left the Bangor Area Homeless Shelter moving into my own apartment in the area, and I am currently a student a the University of Maine at Augusta – Bangor Campus. I know that I couldn’t have come this far without the encouragement and support and the services the Bangor Area Homeless Shelter was able to provide to me. Thank you for considering the Bangor Area Homeless Shelter as the 2008 Agency of Distinction. What the Bangor Area Homeless Shelter is to me. People of all ages walk into the shelter. They come from everywhere with there lives in a mess and are helped there, needs financially, medically, housing, clothing, food, donations are given daily to those in need. And people come in and help with these services like CHCS, PCHC, Penquis Cap, the Police Officers and all the staff and the general public come and even volunteer their time either cleaning or serving food. The help offered is endless to me. People work all day in and day out at the Bangor Homeless Shelter and the services offered outside the shelter to help the shelter, and any questions a person has about anything are answered by someone or people who really seem to care. On the holidays there is always something special and that’s nice especially if people can’t or won’t spend it with their families, and its a place to adjust to the lifestyle of being homeless. Groups are offered to those that need them when they are struggling so very badly, but for me the Bangor Area Homeless Shelter offers a day program whether your staying there or not staying there. When I need to be around people or if anyone else needs to just be in a safe place and ifs its cold and rainy and wintry its a place to be warm to and get some food in a person’s stomach so there not starving to death. And for those staying in the shelter its a roof over our heads so we don’t have to sleep in a ditch somewhere or on the sidewalks or behind a dumpster which I know people who have done that and to me that’s sad or at a bridge or something. I never did like them stories and I believe the Bangor Area Homeless Shelter saved my life so I wouldn’t have to do that. And every time I come in and get something to eat they feed me. 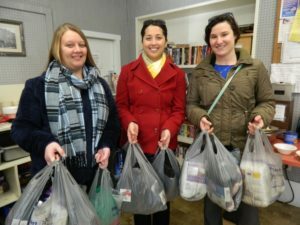 The Bangor Area Homeless Shelter also has food bags for people who don’t have food to bring home. And if there is something you need and they have to give they give it lovingly and that’s what the Bangor Area Shelter has become to me. I love the Bangor Area Homeless Shelter. Appreciation and thank you are often just lip service words. In my case they are deeply true. You and Mike and all the staff have let me keep my dignity and self-esteem. The kindness and help are more than I expected. The staff is understanding and very considerate of my needs. I have stayed in a few shelters on the East Coast and this one is far above the others, in cleanliness and the help that one needs to get back on their feet. One can feel the sincerity in voices of you and the staff. God works in mysterious way and I believe he meant me to be here. I am a recovering alcoholic of 2 years. I truly believe that if I hadn’t received the support that I did here that I would have drank again. The shelter gave me hope and a positive attitude that my life could and would change. My appreciation and gratitude is truly heartfelt and sincere. I wish only the best for the Bangor Area Homeless Shelter so they can keep on helping those in need and were last as I was. Speaking as one who has benefited greatly from the BAHS program and services, I welcome the opportunity to tell my story and to thank those responsible. I have been homeless for the past several years and have enjoyed the hospitality of the BAHS twice prior. Early in March ’02, I found myself desperate and alone in Springfield, Missouri. With nowhere to turn and little hope. I luckily remembered how great “the people” were at the BAHS and headed for Bangor, ME. After a very long trip I was greeted warmly, by Ms Beverly, who has been a source of comfort to myself and many others in the past. After a great lunch, she reassured me of a comfortable bed for the night and I was able to relax and unwind. A shower and a good nights sleep worked wonders for me and I was able to plan my next step, which was to seek out Jim at CHCS and ask for his help, he also was a familiar face from my previous stays. He very professionally, assessed my needs and went to work to attain housing for me. He continues to help me with other problems I have been experiencing. Today in mid-April I have a great apartment and many other creature comforts thanks to his efforts. Being homeless is as horrible as life gets and people like Mike, Dennis, Jim, Beverly and all the staff have earned my gratitude and respect over the years for all their help and hospitality. May God Bless them and may their good work continue for the many others like myself who desperately need their special kind of help.